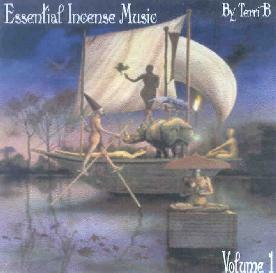 Terri~B - "Essential Incense Music: Volume 1"
Fans of Terri~B's Wrap Me In Your Skin album will be surprised when they hear Essential Incense Music. The album opens like they're about to do a cover of The Beatles' "Within You Without You", but quickly settles into a flow that defines all the music on this 32 minute set. The liner notes state that the music "was created as a background for relaxation and general ambience to accompany meditation". Sitar, Eastern percussion, flutes and other ethnic instruments lay down a floating Indian influenced vibe with Terri very nicely replicating the unique vocal style of female singers in India. I love Indian and Middle Eastern music and there's much to enjoy here, though the highlight is hearing a gifted vocalist such as Terri sing in this style. I don't meditate (though I should) so I can't testify as to the music's benefits in that regard, though I can say it is indeed relaxing and easy to get lost in. If you're a fan of Terri's work with Census Of Hallucinations and The Rabbit's Hat then check this out for a very different experience. For more information you can visit the Stone Premonitions web site at: http://www.aural-innovations.com/stonepremonitions. Contact via snail mail c/o Stone Premonitions; Arch House; Front Street; Alston; Cumbria; CA9 3QW; UK.